KNOW AMERICA 2014, an annual competition ogranized by American Embassy and a Foundation supporting students from villages (Fundacja Wspomagania Wsi). You have a chance to win great prizes and broaden your knowledge about the USA. 8th November 2013 is a deadline. Visit the website to find out more. Punky Night falls on the last Thursday in October and is a Somerset tradition. Some time in the Middle Ages, all the men of Hinto St George went off to a fair. When they failed to return that evening, the women went looking for them by the light of punkies. 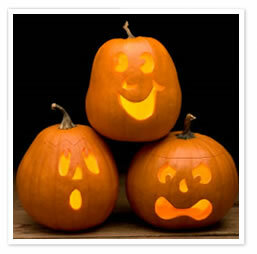 “Punky” is another name for a “pumpkin” which has been hollowed out and has a candle standing inside it. Traditionally on this night, children in the South of England would carve their ‘Punkies’, (pumpkins) into Jack O’Lanterns. Once carved the children would go out in groups and march through the streets, singing traditional ‘punky’ songs, calling in at friendly houses and competing for best lantern with rival groups they meet. The streets would be lit with the light of the Punkies. Nowadays, on Punky Night in Hinton St George, Somerset, local children join a procession through the village streets, swinging their homemade lanterns and going house to house, singing traditional ‘punky’ songs and sometimes getting a few pennies at the front door. Give us a candle, give us a light. You can find more information on that website, including additional facts about October.